The demand for tablets might have dipped over the years, but sometimes, a smartphone just isn't enough. 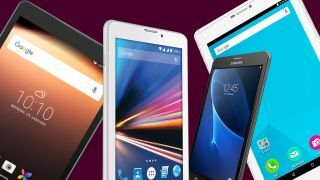 There are several tablets in the market- both budget and expensive- so you can easily get best 4G tablets under Rs 15,000. The Samsung Galaxy Tab A is ideal if you're looking to consume content on a screen larger than a smart phone, but also at a budget price. The 8-inch display is colourful and vibrant to an extent but don't expect it to match AMOLED standards. Though Samsung doesn't specify the processor, a quick look suggests that it's the Snapdragon 430. Paired with 2G RAM, the tablet manages to get the job done with the bare minimum at its disposal. It focuses on efficiency rather than on power. Who shouldn't buy: Those who want a more current version of Android. It's disappointing that a tablet with so much potential is still running on Android Marshmallow. The base variant retails for Rs 12,999 on Amazon, while the 3GB/32GB model costs Rs 14,999.
Who should buy: Those who don't want to compromise on visual appeal and battery. The Galaxy J Max runs on Android 5.1 Lollipop, which is disappointing. It's not the most powerful device in this segment, accompanied by a quad-core processor and 1.5GB RAM. The Lenovo Tab 4 8 is a good option for those who want a well-performing phablet without breaking the bank. If you're not a budding photographer, or even too bothered about camera specs, you could take a look at this one.